The culmination of a great technologist's pursuit of his ideals, the Man-nen Jimeisho occupies a special place in history. Japan recently undertook a national project to disassemble and restore the clock and build a replica, with the goal of bringing Hisashige's handiwork back to life. 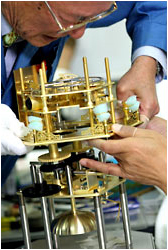 Refurbishing this cultural heirloom, which represents a defining moment in the history of craftsmanship and embodies a genuine passion for artistry, was more than a matter of romantic nostalgia for the past; it was an enterprise of deep significance, for it restored a major symbol of Japanese science and technology. Now, 154 years after it was first built, the masterpiece into which Hisashige poured his spirit of ingenuity has begun marking time for a new era. The national project to restore the Man-nen Jimeisho gets under way. 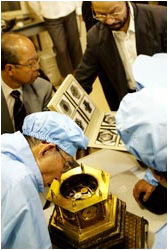 Following a signing ceremony in March 2004, work started on the national project to disassemble and restore the Man-nen Jimeisho and build a replica. 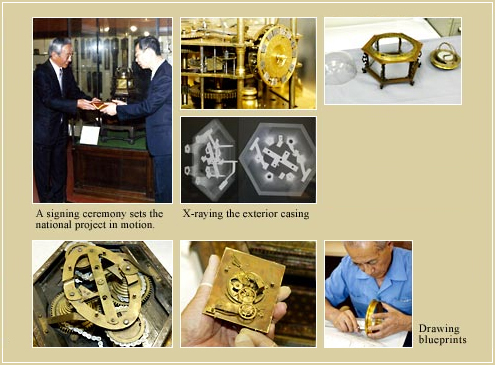 A team of experts under Kazuyoshi Suzuki of the National Science Museum unlocked the secrets of this crowning achievement of Japanese clock making. 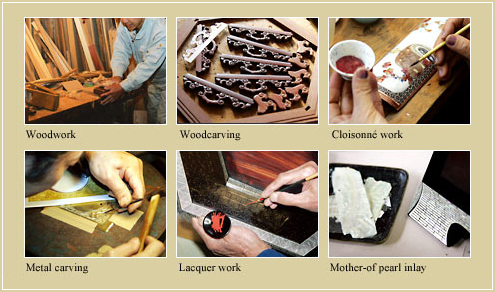 A large team of specialists brings its skills and expertise to creation of the perfect replica. A team that included Hideo Tsuchiya and Yoshinosuke Kessoku, both former employees of Seiko Corporation, as well as traditional craftsmen from Kyoto, pooled superlative skills to create the replica of the Man-nen Jimeisho. 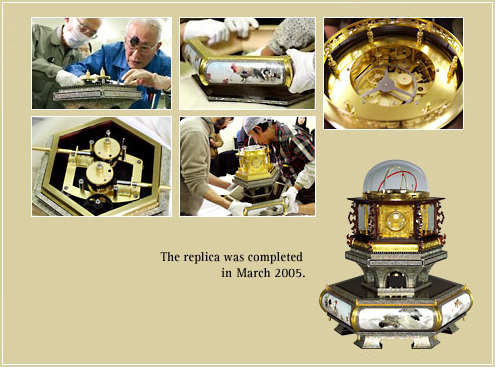 In March 2005, they completed their task, bringing Hisashige's masterpiece back to life after 154 years. Today's leading craftsmen bring all their skills to construction of a replica. The Man-nen Jimeisho is not only a precision instrument; it is also a work of art that embodies the finest techniques of its day. The breathtakingly beautiful exterior casing was created by some of Japan's leading traditional craftsmen. Hisashige's ideas continue to evolve.